The red imported fire ants, Solenopsis invicta, also known as the RIFA is native to South America. In 1930, the RIFA were introduced into United States through the seaport of Alabama. Ships from Brazil unloaded goods infested with RIFA and since then they have spread through America. The ants respond to pheromones released by the first ant that attacks and sting together at the same time. They are highly aggressive and their sting contains necrotising, alkaloid venom resulting in itchy, painful pustules. Fire ants live in colonies of 100,000 to 500,000 ants. The queen ant can lay from 1500 to 5000 eggs a day thus explaining its high population. These ants are attracted to electric circuits and therefore accumulate in electrical equipments like traffic light and air conditioner. The damage to traffic lights in Texas is because of these ants. So how do these ants gather at the electric circuits. Research has shown that ants respond to electric stimulus by producing semiochemicals which in turn attracts more ants and this invasion causes damages and short circuiting of the electric circuits (Vander Meerl, Slowik & Thorvilson, 2002). Research has also shown that the attraction is directly proportional to the field strength of direct current and alternating current (Mackay, 1992). The actual reason of attraction is still not really known but this attraction has caused America billions of dollars a year because of the damage to electrical equipment such as air conditioners, electrical and utility units, traffic signal boxes, telephone junctions, electric pumps for oil and water wells, airport landing lights, computers, and even car electrical systems. “Fire ants vs humans – BBC” by BBC Worldwide Youtube Channel, 9 March 2008. URL: http://www.youtube.com/watch?v=3vVUh-194vU&feature=fvw (accessed on 7 March 2010). Mackay, W. P., S. Bradleigh Vinson, J. Irving, S. Majdi, C. Messer, 1992. Effect of electrical fields on the red imported fire ant (hymenoptera: formicidae). Environmental Entomology, 21(4): 866-870. “Red imported fire ant (Solenopsis invicta)” by Arizona-Sonora Desert Museum. URL: http://www.desertmuseum.org/invaders/invaders_fireant.htm (accessed on 7 March 2010). “Solenopsis invicta” by Alex Wild. The University of Texas at Austin. URL: http://www.sbs.utexas.edu/fireant/Images/Solenopsis_invicta1.JPG (accessed on 7 March 2010). Vander Meer, R. K., T. J. Slowik and H. G. Thorvilson, 2002. Semiochemicals released by electrically stimulated red imported fire ants, Solenopsis invicta. Journal of Chemical Ecology, 28(12): 2585-2600. You are my one and only… OR ARE YOU? 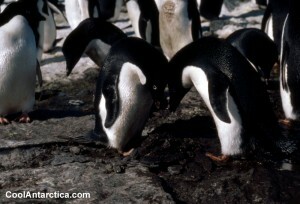 Though Adelie penguins (Pygoscelis adeliae) are monogamous, the couple does not spend the winter together. In fact, the pair migrates separately and will only return to the rookery where they last mate during the breeding season (from November to February). The males will arrive at the breeding site prior to the females to build the nesting sites. Unless one of the partners fails to return, the couple will reunite every breeding season. The penguins are able to recognise its mate’s call or even, physical features. Ecstatic. The male penguins will swing their head, and flap their flippers. These actions show possession of a breeding site, to attract females, and to keep other male intruders away. Mutual. Once paired, both the male and female penguins will stretch their head and neck upward. Bowing (Figure 1). Bowing displays reduce aggression; strengthen bonds and recognition between partners. Are Adelie penguins truly monogamous? Research has found that both male and female Adelie penguins may have more than one breeding partner in its life (F. M. Hunter, G. D. Miller and L.S. Davis, 1995). In fact, about 21-30% of the female penguins were involved in mating with more than one male in a single breeding season, either through extra pair copulations (EPC’s) or mate-switching (Harshaw, 2005). A female may copulate with multiple partners to enhance genetic quality or diversity of her offspring. The female penguin may also mate with numerous males to (1) ensure that her eggs are fertilised in the event of her partner being infertile, (2) gain potential partners in the future years should her partner leave her (F. M. Hunter, G. D. Miller and L.S. Davis, 1995). In addition, it seems that the females engage in EPC’s so as to collect more stones or nesting materials to build a better nest. This will benefit the males in terms of living conditions as well. Furthermore, after the eggs have been laid, the males have the responsibility to incubate them. As such, the male is unable to leave the nest to protect its mate from engaging in EPC’s since an unguarded nest will invite predation. While we decide whether the Adelie penguins are indeed monogamous, it is important to note that the survival of all species of penguins is greatly challenged by weather conditions and food availability. According to Dee Boersma, a University of Washington biology professor, the population of penguins in the Punta Tombo colony has reduced by more than 20% in the last 22 years (Science Daily, 2009). Some possible reasons for the decline are human activities such as oil pollution and overfishing. As such, it is crucial human amend their ways to save our declining ecosystem. “Adelie Penguins”, by Keith Dreher, n.d. URL: http://www.keithdreher.com/adelie.html (accessed on 6 April 2010). “Mating System”, by Lauren Harshaw, 2005. URL: http://www.bio.davidson.edu/people/vecase/Behavior/Spring2005/Harshaw/MatSys.html (accessed on 5 April 2010). In year 1948, two days before Ashgabat earthquake, there was this guy who saw many reptiles appearing in large numbers. Upon witnessing that unusual scene, he immediately reported to the relevant department. However, no one took notice of him and the earthquake proceeded to claim much destruction in the area. Also in 1978, a few days before the Central Asian earthquake, lizards and snakes left the caves and the places where they hibernate in. These show us that the animals are more sensitive to earthquakes compared to human. Animals will exhibit unusual reactions just before an earthquake strikes. Some studies have shown, the surface and the subsurface of the earth will undergo extraordinary physical and chemistry changes before the occurrence of the earthquake. The changes include differences in sound, temperature, vibration wave, electromagnetic wave, the water’s chemical composition and many other more. These will stimulate certain animals as their nerve sensory organs are more sensitive than humans and therefore they will react more instinctively. For example, the dog in the video can feel the vibration earlier than the people in the room. Erratic behavior in dogs, such as excessive barking or biting, could be used to forecast quakes (Maryann Mott, 2003). Besides dogs, other mammals such as cats, mice, cattle will also have unusual behaviors. They will be frightened and start to running, or have cluster migration. A few of them may have different reactions such as being depressed and sluggish. Animal organisms are very sensitive to system and environment change. They are just like an seismograph, which can show us the signals of earthquake effectively. Animals does not only give love and happiness, they also protect us from major disasters that even a scientist cannot explain or predict. This is why we love them so much. 4. “Earthquake Prediction by Animals: Evolution and Sensory Perception,” by Joseph L. Kirschvink, Bulletin of the Seismological Society of America, 90, 2, pp. 312–323, April 2000. 5. “My dog Sophie senses the 6.5 earthquake at the Times-Standard newspaper in Eureka CA,” by BrianWheeler12 YouTube Channel, January 10 2010. URL: http://www.youtube.com/watch?v=FV4EMzyJsqU (accessed on 4 Apr 2010). Are the American coots really coot? There are several examples of birds like cuckoos and cowbirds laying their eggs in other birds’ nest. This behaviour is called brood parasitism. The interesting phenomenon is that the adult host will still feed the chicks of those birds mentioned earlier despite the obvious difference in size between its own chicks and the parasitic chicks. So are all birds as foolish as those hosts shown in the video? The answer is no. The American coot, Fulica Americana is a good example of a bird which is able to not be like those hosts that are made use by cuckoo and cowbirds. The American coot will display brood parasitism on its own species. The females will usually lay a few eggs in the nests next to theirs to increase the chances of survival of their offspring due to the lack of food in its habitat. The host coot will place the parasitic eggs in position which will delay the hatching of the eggs or bury them deep down into the nesting materials (Stephens, 2003). “With the parasitic chicks, they don’t just let them starve, they attack them with a viciousness we hadn’t seen before.” said Lyon (Stephens, 2009). This has happened as the coots are able to imprint on their first-hatched chicks due to the fact that their eggs usually hatched first and the parasitic eggs are only deposited on the nest when there are eggs in it (Stephens, 2009). In a habitat with limited food, the coots are forced to develop such ability to ensure that they have more potential offspring of their own. But it is still a surprising finding as the coots are named as coots for a reason. 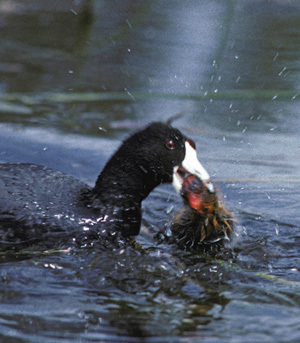 1.”Soap opera in the marsh: Coots foil nest invaders, reject impostors,” by Tim Stephens. Published on 16 Dec 2009. URL:http://www.ucsc.edu/news_events/text.asp?pid=3445 (assessed on 5th April 2009). 2. “Coots can count: Study shows surprisingly sophisticated nesting behavior in common marsh birds” by Tim Stephens. Published on 7th April 2003. URL:http://www.ucsc.edu/currents/02-03/04-07/coots.html(assessed on 5th April 2009).